A large and super enthusiastic crowd showed up at Plano East Senior High (PESH) on Sat., Apr. 6, to celebrate the 4th Annual Autism Awareness event featuring a basketball game between combined members of the Murphy and Plano police departments and Panther Pride, the Special Olympics Basketball team of Plano East High School. 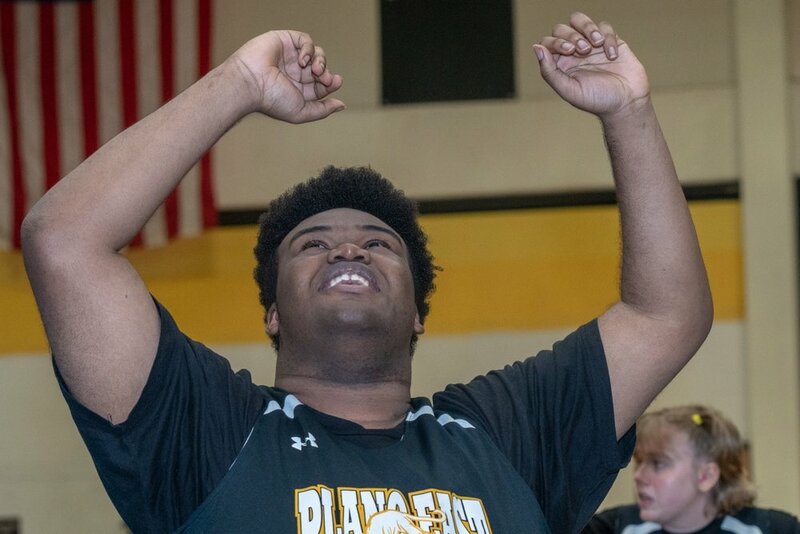 Before the game began, the PESH drum corps and cheerleaders got the crowd amped up and Kendall Parker of Plano won a three-point shot contest. Anthony Ruttenburg is a teacher as well as the Head of Delegation for the Special Olympics at PESH. He said, “The Annual Autism Awareness Event is important because it gives families in the community an opportunity to gain insight into the world of Autism. Everyone comes together for one common goal: to gain a better understanding of Autism and to support the special needs community as a whole”. Autism is a disorder with a wide spectrum of conditions that challenge a person’s social skills, verbal and written communication skills, and repetitive behaviors. It affects one of every forty-two boys, and one of every one hundred eighty-nine girls according to the Center for Disease Control (CDC). Panther Pride demonstrated adept ball control, passed to each other frequently and dunked an amazing number of shots, including several three-pointers. The score? Everyone had a great time!